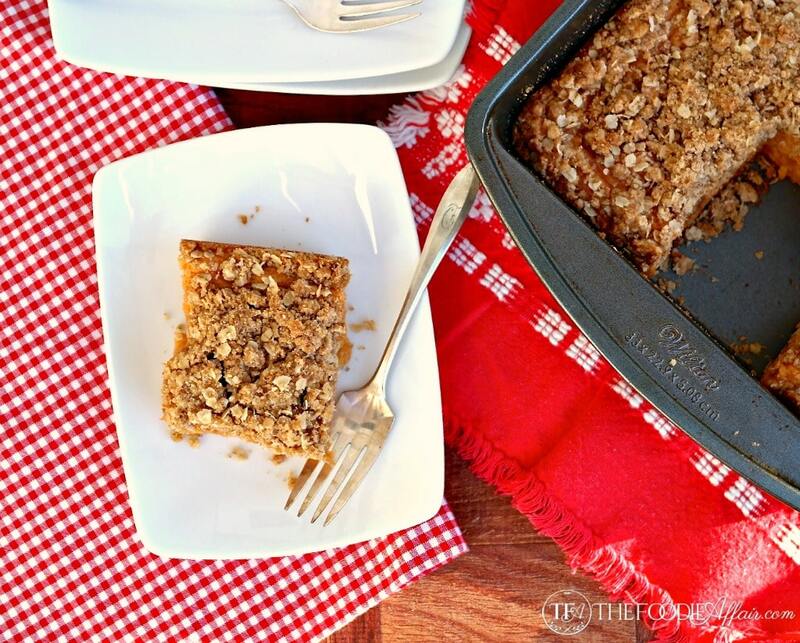 Tender Sweet Potato Coffee Cake with an oatmeal and brown sugar topping makes a wonderful morning snack or evening dessert! 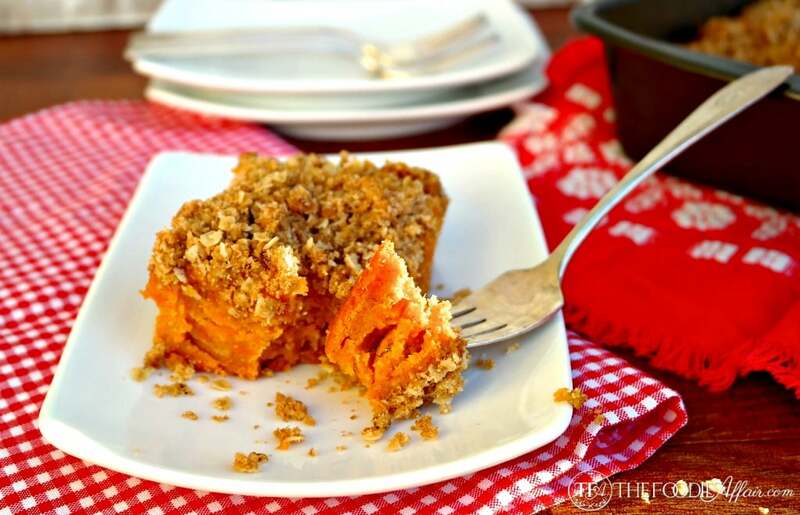 Sweet potatoes are one of my very favorite veggies and I look forward to making our most requested family recipe, Sweet Potato Casserole every year. We had the casserole on our table for both of our Thanksgiving and Christmas feasts. Each time I made the casserole I roasted too many sweet potatoes, so I froze the extra pulp to use it in another recipe. I was planning on whipping it up into smoothies and thought I would re-create my Pumpkin Pie Spice Smoothie, but instead this coffee cake happened! This recipe bakes in a 9 x 13 inch pan, so it’s perfect for a crowd. I brought this to work before leaving on vacation and although I usually write a note explaining what I’m sharing, I was a little sneaky and left no hints to what was in the pan. I was worried that if I mentioned that the cake was made with sweet potatoes, then it would sound too healthy and wouldn’t be eaten! haha! First, just because it has a root veggie in it, it doesn’t make this healthy, it just adds a few extra vitamins that you might not get in other coffee cakes! Second, silly me for thinking no one would like this! The whole pan was clean by the end of the day, and no one questioned the ingredients. I take that as a major win for The Foodie Affair. You’re welcome for the extra veggies. Preheat oven to 350 degrees. Spray a 9 x 13 inch baking pan with cooking spray and set aside. In a large bowl whisk together flour, sugar, and pumpkin pie spice. In a separate bowl blend together sweet potato, milk, butter, eggs and vanilla. Mix into flour/sugar mixture and blend well. In a separate bowl cut together with a pastry blender or fork the butter, brown sugar, flour, pumpkin pie spice, and oats. Pour half of the batter into the prepared pan, top with half of the crumb mixture, then repeat. I love sweet potatoes too but I’ve never made a cake like this. I want this today. I have all the ingredients and I have the time. Win! I adore everything about this cake and can’t wait to make it! Thank you, Linda! Let me know how you like it! It must be bursting with flavors! I wish to you a very Happy New Year! Happy New Year to you as well, Katerina! I’ve never heard of anything more delicious sounding; yet one more use for sweet potatoes! Thanks so much for sharing this one. 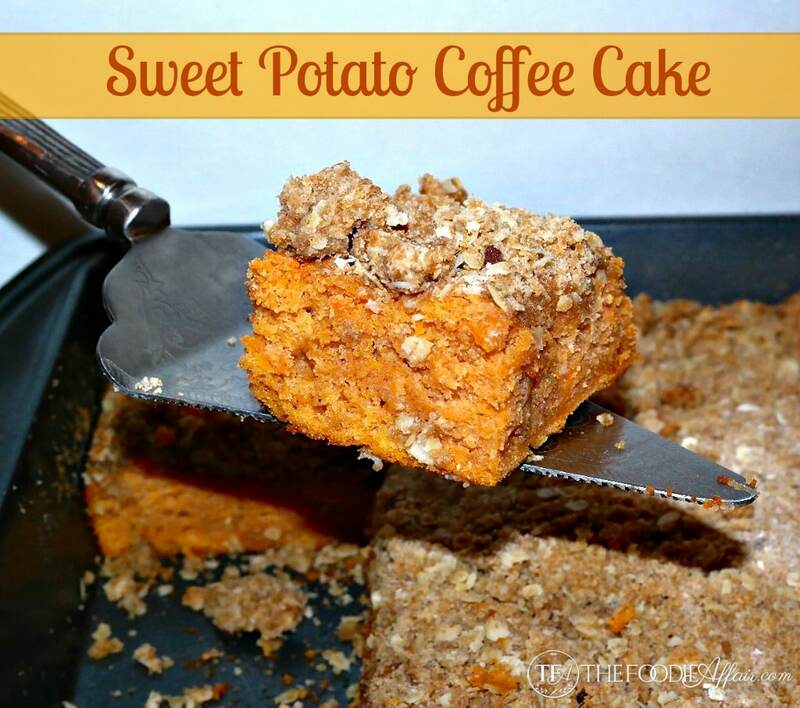 Love sweet potatoes and so pleased that this coffee cake came out so tasty! Sounds perfect for weekend breakfast with all the delicious holiday spice flavors. This sounds awesome I am definitely making it for new years morning! Thanks! Hope you loved it! Thank you! How creative! It looks so delicious. Love all the flavors in this! well now this just looks like one of the tastiest things ever! this cake looks flaky, moist, and sooo tasty Sandra! and btw I love the new look of your site Sandra! This looks amazing. Can’t wait to try it on New Year’s morning! Hope it was enjoyed by all, Mary Ellen! I never in a million years would have thought of this! Wish I worked at YOUR work…. The cake looks incredibly moist, is it more moist that usual cakes?? 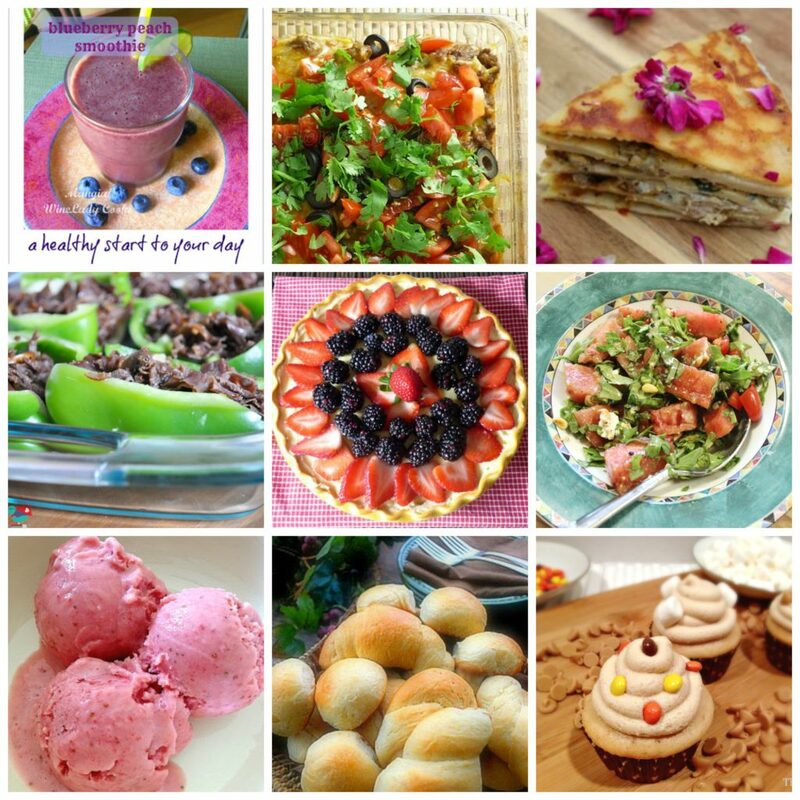 The best time of the year in my opinion, and especially love all the baking that takes place! I know I’d love this cake! Looks absolutely amazing! Thanks, Sheena! This tastes great with a cup of tea! Isn’t that the truth, if you tell them it is healthy they won’t even try it. haha But this looks great! Lol – I know, it’s like sneaking in veggies when least expected! I had to force myself to not eat the pulp just as it was so that I could use it for another recipe. So glad I waited for these results 🙂 Cheers, Charlie! What a terrific idea…the coffee cake looks great as does the new look of your blog. Wishing you all the best for the new year. This cake looks so moist! I bet it smells so good while baking! Oh, yes this did smell amazing! Plenty of butter in this recipe, plus the sweet potatoes add a lot of moisture too! What?! 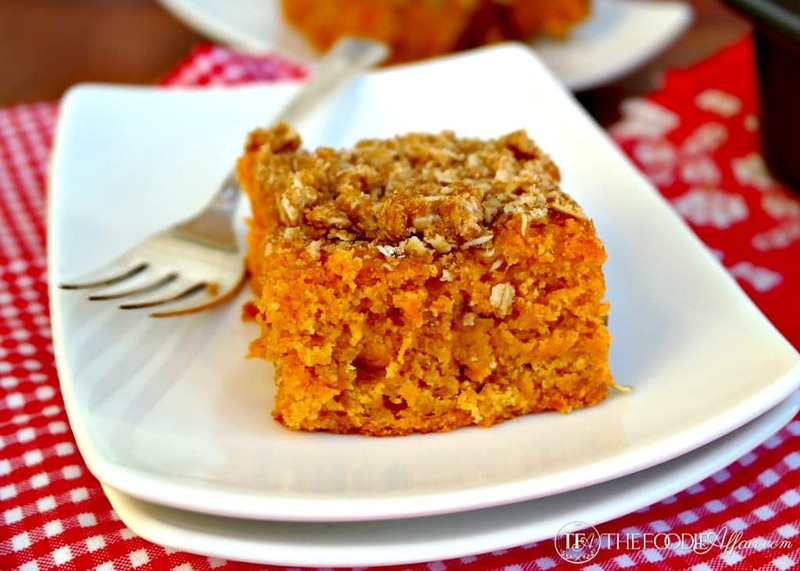 Sweet potato coffee cake?! This is genius!!! I want a bite right now! This hit the spot for sure! What a fantastic coffeecake! My family would go crazy for it—as would I! Happy, happy New Year, Sandra! Thank you, Liz! Wishing you a wonderful new year! Double yum! I just love anything with a crumble topping and this one looks so good. Wishing you a super 2015! Any idea if this will work in a tube pan? I just like the way a coffee cake looks in a nice display. I haven’t tried it, but I bet it will cook fine. Just make sure to monitor the amount of batter closely so it doesn’t overflow from the pan when it expands while baking. Let me know how it worked for you! Excellent! I bet it looked pretty!